Photographic artist Geoffrey Vail Brown ventures into a former asylum to produce a series of environmental figure studies, resulting in a one of a kind series of work. "After spending only a few minutes inside these majestic structures, there is an undeniable sense of what can be best described as a truly unique 'essence of place'. It was this sense of the former Asylum's identity - for lack of a better word - that served as the catalyst for the study in the pages that follow. Attentive craftsmanship, along with the passage of time and whispers of its former self, have combined to breathe a unique feeling of life into the place. In this spirit, my work began; youth, contrasted with age. Skin contrasted with the textures of years of gentle decay. Stark luminescence meeting sharp edges of shadow. A celebration of the beauty within the ruin." View examples from this series. "This new book from Michigan photographer Geoffrey Brown makes it astoundingly evident that individual photographers, without the backing of a major publisher, can produce high quality books worthy of even the most demanding collectors. 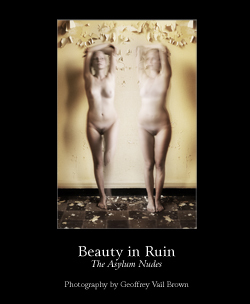 Beauty in Ruin celebrates the work created around a single project where Geoffrey shot a voluminous number of nudes with a model in the ruins of an abandoned asylum. His Farberesque style, striking composition, and melancholic scenarios instill incongruent feelings of attraction as well as remorse. This is a most interesting body of work." "Magnifici nudi del fotografo Geoffrey Vail Brown che rivela in ognuna delle sue gallery grande padronanza e versatilità tecnica (b/n, colore, infrarosso, manipolazione digitale), oltre che una felicissima ispirazione. Notevole la recente serie "Beauty in Ruin - The Asylum Nudes", collezione di bellezze senza veli ritratte nelle fatiscenti camerate di un manicomio in disuso con effetti sorprendenti."